This dish can be frozen before it's put into the oven, ready to be thawed and baked at a later date. Warm the oil in a frying pan set over a medium heat. Add the chicken and cook for a few minutes just to seal it, then add the onion, broccoli florets, mushrooms and garlic. Season with a pinch of salt and pepper and cook for about 5 minutes more, until the onion has started to soften. Add the milk and cook for about 5 minutes, then check the seasoning again. Mix the cornflour with the water in a small bowl, then add to the pan and cook for 1 or 2 minutes, stirring, until creamy and thick. Transfer to an ovenproof baking dish and sprinkle with the breadcrumbs. 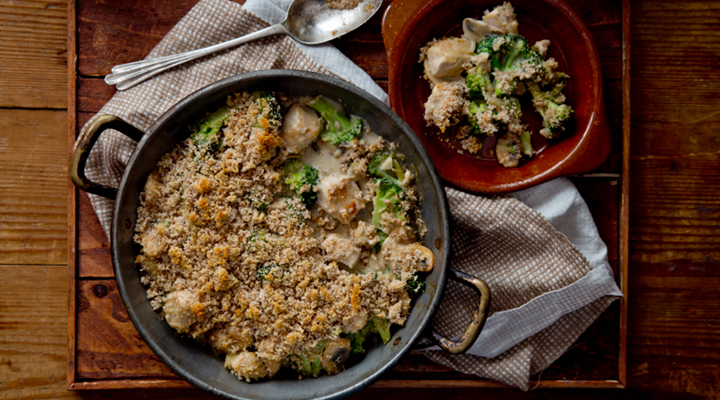 Bake in the oven for 10 minutes, until the chicken and broccoli filling is bubbling and the breadcrumbs are golden. Very simple to make and extremely tasty. I served this with creamed potatoes. Fabulous. Very quick, very tasty. We enjoyed it. I will add a little more mushroom & broccoli next time.